This sparkling beverage is perfect for your next get-together! 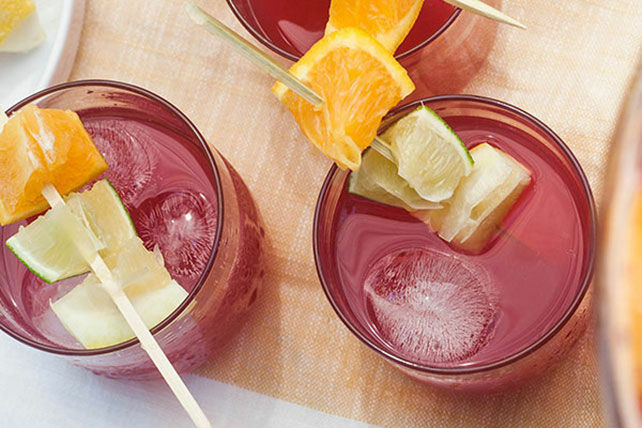 It's a party-perfect punch for all seasons. Add cranberry juice cocktail, orange juice and water to drink mix in 2-L plastic or glass pitcher; stir until mix is dissolved. Stir in club soda and fruit just before serving. Cut additional fruit into chunks; thread onto skewers. Use to garnish the filled glasses. This refreshing beverage can be made ahead of time. Prepare as directed, except do not add the club soda and fruit. Refrigerate up to 24 hours. Stir in club soda and fruit just before serving.